Scientists at the University of Ohio have discovered what they claim to be the world’s smallest superconductor, which is less than 1nm in width. 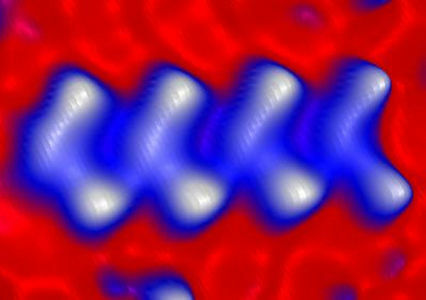 The superconductor works on a molecular scale and is formed by four pairs of molecules. The research was published in Nature’s Nanotechnology paper, and has been called a path-breaking idea in the field of nanoscale electronics. In the past, interconnects of the modern chip fabrication process have always had problems with Joule heating and melting, as they traditionally have been built by metal, which conducts heat equally well as electricity. Interconnects on the nanoscale are called nanowires, whose electrical resistance unfortunately increases as they are made smaller. However, using the new world’s smallest superconductor as the basis for a new-generation of nanowires might remove this problem altogether. Superconductors are so named because their electrical resistance tends towards zero, and will conduct electricity while only negligibly causing heat or power loss. The breakthrough comes with the fact that a certain superconductor is now known to be able to function on the molecular level, completely at odds with what scientists thought was a unshakeable truth, that superconductors only functioned on the macroscopic level. These findings will have tremendous applications in nanoscale electronics, most notably in microprocessor design and fabrication.